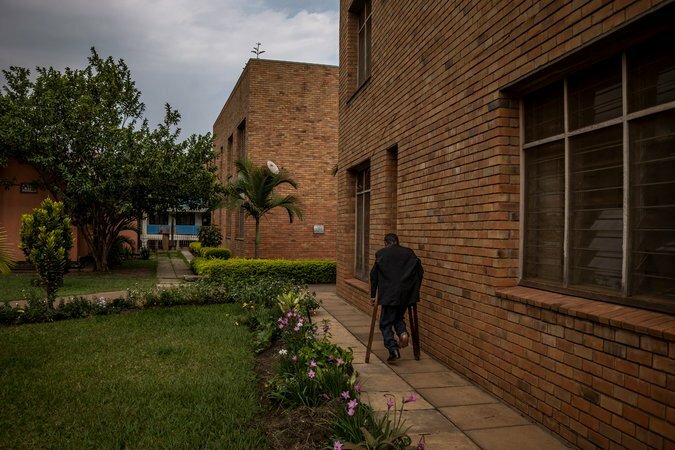 KAMPALA, UGANDA (THE NEW YORK TIMES) — Pain is only the latest woe in John Bizimungu’s life. The American delegation to the International Narcotics Control Board, a United Nations agency, “uses frightening war-on-drugs rhetoric,” said Meg O’Brien, the founder of Treat the Pain, an advocacy group devoted to bringing palliative care to poor countries. Uganda has implemented an innovative solution. Here, liquid morphine is produced by a private charity overseen by the government. And with doctors in short supply, the law lets even nurses prescribe morphine after specialized training. About 11 percent of Ugandans needing morphine get it. Inadequate as that is, it makes Uganda a standout not just in Africa, but in the world. Yet there is very little opioid abuse here; alcohol, marijuana and khat are far bigger problems. A recent major study by The Lancet Commission on Global Access to Palliative Care and Pain Relief described a “broad and deep abyss” in access to painkillers between rich countries and poor ones. The United States, the report said, produces or imports 31 times as much narcotic pain-relievers it needs whether in legal or illegal form: morphine, hydrocodone, heroin, methadone, fentanyl and so on. Haiti, by contrast, gets slightly less than 1 percent of what it needs. And Nigeria, on a per-capita basis, gets only a quarter of what Haiti gets: 0.2 percent of its need. Even in big countries with domestic pharmaceutical industries, citizens still get shortchanged on pain relief, the report said. India and Indonesia, the second- and fourth-most populous countries on the planet, each supply only 4 percent of their own needs. Russia is at 8 percent. China, at 16 percent, barely beats Uganda. “Each country has its own barriers,” said Dr. James F. Cleary, director of pain and policy studies at the University of Wisconsin’s medical school and a member of the commission that produced the Lancet study. Pharmaceutical companies are uninterested in selling the generic morphine needed by poor countries because it is cheap and yields little profit. Enough morphine to treat the entire world for end-of-life suffering would cost only $145 million a year, the Lancet report found. Moreover, to treat all the children underage 15 needing it — for severe burns, surgery, car accidents, pain from sickle cell disease, cancerous tumors crushing spinal cords and so on — would cost a mere $1 million. Some pharmaceutical companies do try to market patented time-release oxycodone and other highly profitable opioids in middle-income countries — but governments are often wary because of the epidemic of drug abuse that has swept the United States. “You only have to see one Time magazine cover, and countries say, ‘This isn’t something we want,’” Dr. Cleary said. Demand for pain relief “needs a champion in each country,” said Felicia Marie Knaul, a health economist at the University of Miami and lead author of the Lancet report. ¶ The policy had outspoken local champions: Dr. Anne Merriman, a former missionary nun who in 1993 founded Hospice Africa Uganda to care for the terminally ill; Rose Kiwanuka, the first nurse trained in palliative care in this country, who now heads the Palliative Care Association of Uganda; and Dr. Jack Jagwe, a health ministry official who recognized the need. Uganda’s president, Yoweri Museveni, who has been in office since 1986, accepted the import of opioids after Dr. Jagwe endorsed them. Mr. Museveni’s response to AIDS was also forward-thinking; when other presidents were denying their countries even had it, he pioneered “ABC prevention” — Abstain/Be Faithful/Use Condoms. ¶ And perhaps most important: the only opioid the government permits outside hospitals is pint bottles of morphine diluted in water. The drug is distributed free, at government expense, undercutting incentives for pharmaceutical companies to fight for market share. The bottled morphine comes in two strengths: 0.5 gram or 5 grams per 500 milliliters. Even the weaker one dulls the pain suffered by Mr. Bizimungu, who is succumbing slowly to a form of Kaposi’s sarcoma that is not triggered by H.I.V. The bottles are a simple and ingenious way to prevent addiction. Getting high would require drinking gallons of the bitter, slightly nauseating solution. Distilling enough morphine to inject would require boiling away gallons. “You can drink a whole bottle and all you’d get is some nausea and constipation, and be sleepy,” said Rinty Kintu, the Uganda coordinator at Treat the Pain. At the Cancer Charity Foundation, a hospice for adults with cancer in Kampala, liquid morphine is easing the last days of John Kanakura, 55, whose colon cancer has spread to his liver. Mr. Kanakura’s daily bottle gives him about eight hours of pain relief, letting him get some sleep, his son, Philip Mutabazi, 18, said. Morphine is not prescribed nearly as freely in Uganda as opioids have been in the United States.